Prior to the invention of the laryngoscope, the extent of each register and possible range of each part of the voice was the same. By this I mean that each part of the voice is functionally and potentially the same; what differs is just how high or low each type of voice can sing in each part. According to this rule we can train each and every voice, high or low, in the same way. There is functionally no difference between each of the voice types, and this is what I mean by simple voice training. The Registers: The break between the Lower and Upper Registers is about E-flat above middle C for all voices. This can change for each individual after the three Voices (Upper Voice, Middle Voice, Lower Voice) have been developed. The extent of the pure Upper Register is always about one octave: B to B’ (B3 to B4). The Chest Voice: How high each singer can bring the Chest Voice differs according to the type of voice; for example, female voices: the contralto takes the Chest Voice (not the Chest Register!) higher than the Mezzo-Soprano, and she takes her Chest Voice one step higher than the Soprano. The extent of the Middle Voice is, for all voices put together, one tone higher and lower than that of the pure Upper Register. This shows that the Middle Voice is the coordinated Upper Register. 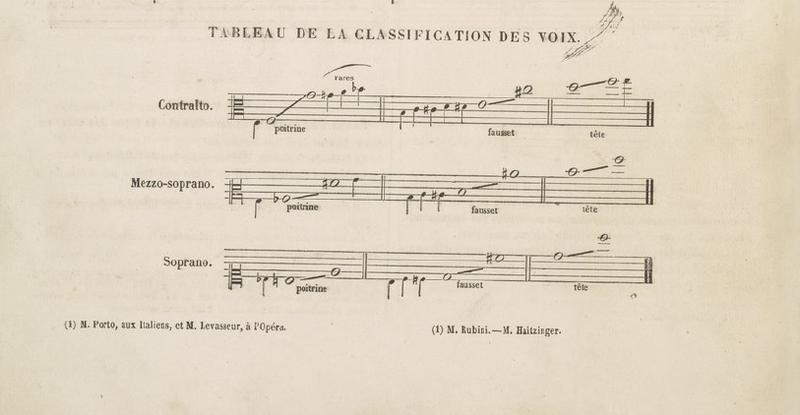 For all females, as well as for the Haute-Contre and Tenor, the Middle Voice is exactly the same. Although the Baritone and Bass have a Middle Voice range a minor third lower than this, this is still very close the range of the pure Upper Register. The Upper Voice always begins on the same note, except that Garcia doesn’t give the Baritone and Bass an Upper Voice. Brownless, Edmund. “Thoughts on Simple Singing: Toward a More Adequate Vocal Terminology”, Modern Singer Master: Essays In Honor Of Cornelius L. Reid. Scarecrow Press, 2005. Images from Manuel Garcia’s “Traité de l’Art du Chant”, 1847. Previous postDon’t Go Against the GODFATHER!